Combine first five ingredients in a medium bowl. Add milk, egg, and 1/3 c. melted butter, mix gently to combine. Butter a muffin tin, and fill muffin cups 1/2 full and bake for 15-20 minutes, until tops are light brown and springy to the touch. While muffins are still warm, dip in butter and roll in cinnamon and sugar. Serve warm. These are really yummy. I'd personally give them 4 hearts, but my kids and some guests from Japan loved them so much, that I have to give them 5 hearts. If you're cooking for kids, these are a guaranteed smash hit! Good to let kids cook themselves too, since they are so easy. Mmm. These sound great! I've made a muffin similar, but it used buttermilk. My daughter who is 12 made these with a friend of hers and they LOVED them...super easy to make and really yummy! I made these this morning for breakfast and they turned out perfectly. They are tender and moist. Yet, they are a little more bland than I would like. Next time I will probably add more nutmeg and some cinnamon and/or cloves to the mix. Also, I used buttermilk in place of regular milk. My kids devoured these muffins though! Definitely a success! Very good, but not too healthy! All I hear from my son is "make them again Mom!" Thanks! Oh boy, did these ever look easy and delicious...the kids love love loved these! Thank you for posting. I made these at Christmas and my family loved them. They said they are like snickerdoodles times 10!! Very moist and yummy..
Who would pass a muffin? I enjoy making it and we enjoy eating it. Sharing the tasty muffins is always fun. This is another addition to my muffin recipes. Thanks for sharing! These sound great. Don't the cookies have sour crm? anyone done it that way? I love these! 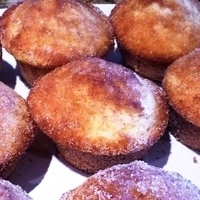 I make them in the mini-muffin pans so when you eat them, you get a crunch of the sugar crust in every bite. My man loves snickerdoodles! I'm just breaking into the breakfast/brunch scene, and this sounds like a fantastic way to start off! !